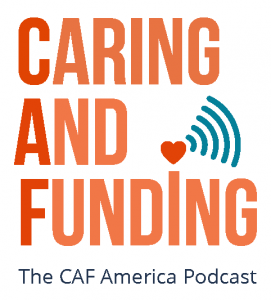 CAF America’s CEO, Ted Hart, hosts a web-based, half-hour radio show designed to help our peers and colleagues understand the emerging trends, best practices, and issues in the field of international philanthropy. Each show features a Q&A style conversation with a philanthropy professional who brings specialized expertise and insight on topics related to global grantmaking and cross-border giving. The shows are available to stream as a podcast immediately after they conclude. All of the podcasts are available in the links below and can also be found on the show’s page. Interested in learning about some of the topics in the just-released Workbook Edition ofCross-Border Giving: A Legal and Practical Guide? Join Ted Hart, Editor of Cross-Border Giving: A Legal and Practical Guide and President and CEO of CAF America, as we take a deep dive into Chapter 9: Responsible Giving, The International Grantmakers’ Perspective with its author, Jane Peebles. Join CAF America President and CEO, Ted Hart, as we discuss recent corporate giving data with André Solórzano, Senior Manager of Data Insights and Giving Numbers at CECP (Chief Executives for Corporate Purpose). With corporations playing a growing role in cross-border philanthropy, make sure you don’t miss out on this special show for the latest insights and trends in corporate philanthropy! Philanthropy in the Philippines: A Local Perspective Victoria Garchitorena – Ayala Corp. Sustainable Finance & Philanthropy: Addressing the World’s Most Urgent Problems Erika Karp – Cornerstone Capital Inc.